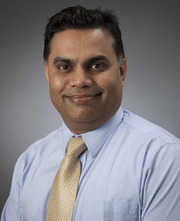 I am a Professor of Psychiatry at Case Western Reserve University School of Medicine and the Vice Chairman for Education, Residency Program Director and the Chief of Geriatric Psychiatry at MetroHealth, Cleveland, Ohio. I also maintain my appointment as an Associate Clinical Professor of Psychiatry at Yale University School of Medicine. I graduated from the University of Kerala, Kerala, India. I trained in Psychiatry at the University of Leeds in England and at the University of Vermont in Burlington, Vermont. During my residency training in England, I also attained a Post Graduate Diploma in Clinical Psychiatry from the University in Leeds. I completed my Geriatric Psychiatry Fellowship at Yale University School of Medicine, New Haven, CT. I have received three ‘Outstanding Teaching Attending Awards’ and the ‘Chairman’s Award’ for outstanding teaching, research, and clinical work from the Department of Psychiatry at Yale University School of Medicine. I also received the Teacher of the Year Award at the Department of Psychiatry, Case Western Reserve University MetroHealth Program in June, 2015. I am a recipient of the Geriatric Academic Career Award (GACA) instituted by the Department of Health and Human Services (DHHS). I was a recipient of the American Association for Geriatric Psychiatry, 2013-Clinician of the Year Award. I am a Distinguished Fellow at the American Psychiatric Association. I am also the President Elect of the International Medical Graduates (IMG) Caucus of the American Psychiatric Association. I have over 90 publications on various topics in psychiatry. In addition, I am a chief editor for three books in psychiatry. I serve on the editorial board of 13 peer reviewed national and international journals in psychiatry. Additionally, I am a reviewer for 22 journals including the American Journal of Geriatric Psychiatry, the American Journal of Psychiatry, and the American Journal of Alzheimer’s Disease and other Dementias.